Do you feel responsible for our future? Are you tired of waiting for a breakthrough at climate conferences? If you are already taking action yourself, you are our ClimateChamp and we want to get to know you! 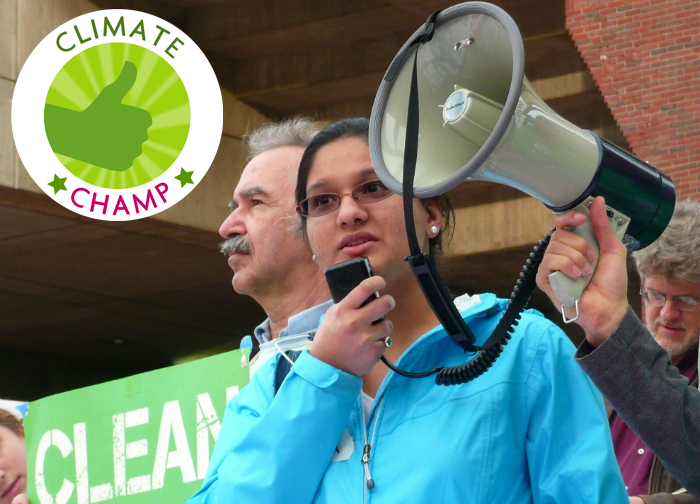 Answer our questionnaire to become a part of our new blog series, take your chance to be nominated as a Climate Champ. This time we feature Mourad Farahat from Cairo. What is your name? How old are you? And where do you live? 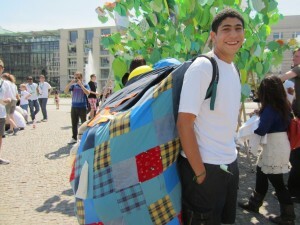 My name is Mourad Farahat, I am 16 and I live in the Cairo suburb of El Tagamoa El Khames. How does climate change affect your everyday life in your community? Climate change has had several adverse effects on the Egyptian community, and could lead to damage beyond repair. For example, it has caused an ever-increasing amount of problems in the food sector, as food production is not able to keep up with the increase in the Egyptian population. The effects are amplified by the incessant erosion of the Nile Delta. As seawater levels rise, the once fertile Nile Delta begins to absorb saltwater instead of freshwater, making it infertile. This has led to rising food and water prices, which widens the gap between rich and the poor. What prompted you to get involved in fighting climate change? There was no specific trigger which encouraged me to start fighting climate change. Rather, it was the fact that the fight against climate change has given me the opportunity of a lifetime – to be part of a cause which will dictate the future. How exactly do you fight climate change? I fight climate change in any legal way I can. I have joined an organization called youthinkgreen, which has given me a perspective on the fight against climate change on a global scale. And I am a part of a local grassroots division of youthinkgreen in Egypt which promotes green action, most notably a recycling project which we have successfully initiated in our school and are hoping to expand. It may not seem like much, but it is a start nonetheless. What do you have to say to climate change deniers? There is ample evidence which proves beyond reasonable doubt that climate change is not only real, but that it has already started taking a toll on our planet. Now is not the time for petty squabbles about the existence of climate change; it is time for us to ask ourselves how we, as the human race, can overcome this global epidemic. Worst case scenario: What do you think your city will look like 10 years from now if no action is taken to fight climate change? The city of Cairo will be dirtier, louder, more polluted and consequently its inhabitants will be more prone to pollution-induced illnesses, gridlocks and as a result will consume more energy. The number of slums will continue to grow in correlation with the population and the living standards of each Egyptian. People will be less happy with their quality of life, as food and utility prices will continue to rise. It is a very bleak outlook, and a slightly frightening one for that matter. Best case scenario: What do you think your city will look like 10 years from now, if more and more action is taken to fight climate change? People will have a completely different outlook on life. Many people will have found a cause worthy of their support, which would completely alter their outlook on life. In other words, the city and its inhabitants will respond to the actions taken against climate change. This could translate into more job opportunities in the field of sustainable technologies, a greener Cairo and an increase in foreign investment in the Egyptian “green” market, which would bolster the economy. Briefly, what do you want your government to do as far as climate change is concerned? I am of the opinion that the government should re-evaluate its expenditures and prioritize investment in green technology which offers a sustainable solution to Egypt’s pressing problems. Also, the government should begin taking action against rising sea levels in the Nile Delta, which threatens to displace seven million people and cause massive food shortages. How can interested people take part in your project? Our project’s aim is to encourage people around the world to live sustainably. Therefore, I believe that anyone who is interested in my project should independently develop a sustainable framework suitable for his/her local community, and seek support for its application. By doing so he/she would be advocating a sustainable lifestyle and making it available to the people who require it, which is what we aim to do at youthinkgreen (www.youthinkgreen.org). Climate champs – …fight climate change now, not in 10 years! Do you feel responsible for our future? Are you tired of waiting for a breakthrough at climate conferences? If you are already taking action yourself, you are our ClimateChamp and we want to get to know you! Answer our questionnaire to become a part of our new blog series, take your chance to be nominated as a Climate Champ. My name is Anke Britta Schmidt. I am 18 years old and I live in Melle, which is a small city near to Osnabrück in Germany. How does the climate change affect your everyday life in your community? In Germany the climate change does not affect the everyday live very much. Maybe in the future prices for food will increase or the temperature will rise a bit. But it is not as dangerous as for people who live in Africa or Asia. What trigger event led you to start fighting climate change? For me starting to fight the climate change was a lucky coincidence. I found a note at the notice board in my school. A teacher was searching for pupils for his new study group. He wanted to train them to become climate ambassadors. I went to the first meeting and it sounded very interesting to me. So I enrolled for this course. I take part in the international youth project youthinkgreen (www.youthinkgreen.org). In this project we learn very much about climate change and things one can do against it. Every group has to work on a sustainable project. 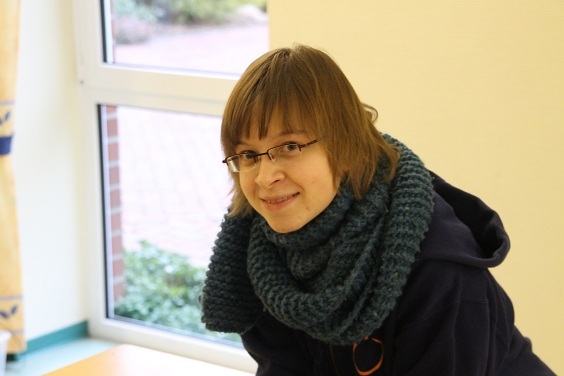 Our group from Osnabrück works with children at the age of 8 to 10 years. We talk with them about climate change and general things like rubbish. At the moment we teach them the topic energy. We meet the children once per week. During our last meeting we were able to have a look at an electric car. The children were allowed to take a short ride in the cars. They had a lot of fun. Our idea is showing children very early that our environment is very important to us and that we have to safe it. Some other members of our Osnabrücker group produce their own radio broadcast show once a month. In their program they talk about environmentally topics and present things that are good for the nature – like a solar tree to charge mobile phones. They also talk about other projects from youthinkgreen or criticize bad developments in politics or in the society. There is also another part of our Osnabrücker group that had created a shopping guide. They had a look at different shops and restaurants in Osnabrück and wrote texts about these shops where you are can to buy products that are produced eco friendly. This shopping guide will be published soon. What do you say to climate change deniers? We are not the only human living on the earth. We will have children and they will have children, too. When we destroy the earth today we steal our future and the future of our children. Today we use a lot of chemistry, for fracking for example. If you visit the places where fracking takes place, you can easily notice bad effects like sick people or burning water. These are the terrible consequences of pumping chemicals deep into the earth to get natural gas and oil. When you look at rivers for example you can easily measure changes. You only have to compare the ordinary water level from now with the water level from twenty or more years ago. Maybe we are able to convince climate change deniers to start helping the environment. By doing this, they may start believing in the climate change. Worst case scenario: What do you think your city looks like 10 years from now, if no action had been taken to fight climate change? There won’t be that many changes in Germany. In other parts of the world there will be much more problems: the sea level will rise, as well as the temperature. No human life will be possible in some parts. Maybe some refugees will come to Europe because they live in these parts of the world. This would lead to more social problems. Best case scenario: What do you think your city looks like 10 years from now, if more and more action had been taken to fight climate change? In Osnabrück there are plans that in 10 or 15 years there will only be electric or hybrid busses. There is also a campaign called “mobility 2030”. The aim of this campaign is that the people of Osnabrück change their city. They can make suggestions how these changes should look like. They can take photos, paint pictures, write letters or stories and film their ideas. All these ideas will be published on the campaign homepage. Short and simple: What do you demand from your government as far as climate change is concerned? I demand from my government that they convince countries like the United States, India and China to start to fight the climate change now, not in 10 years. If we want to save the world, there has to be taken action today not in some day in the future! Interested people can search for a youthinkgreen group nearby or they can start their own group. If they don´t have enough time, they can participate in single activities of the groups. Climate Champ – This isn’t a game. Our future is at stake. 1.What is your name, how old are you and where do you live? My name is Srijesa Khasnabish and I’m eighteen years old. I’ve lived in Lexington, Massachusetts (USA) for most of my life. 2.How does the climate change affect your everyday life / your community? I am shocked by how climate change impacts so many different aspects of my everyday life. For example, how I get to school in the morning: if I wake up early, I take the bus and save some carbon dioxide emissions. If I wake up late, miss the bus, and have to drive to school, I’m further contributing to global warming. I always shake my head in disgrace when I see my peers driving to the town center in the middle of the day whereas it only take seven minutes to walk there. This is one thing that motivates me to action. What is most detrimental to my community is the severe storms we’ve been experiencing. During Hurricane Sandy, damages were extensive. An old pine tree even fell on my house and crashed into my living room! Many people’s basements were also flooded and most of our community was without power for up to 3 days. 3.What trigger event led you to start fighting climate change? What sparked my interest in the climate change movement was an assembly I watched four years ago, presented by the Alliance for Climate Education (ACE) and created to educate youth about climate change and inspire solutions. The forty-five minutes I spent watching this assembly changed my perspective radically and converted me into a fervent climate activist. Today I am the New England Youth Representative for ACE, where I help to galvanize the Youth Climate Movement in my local community. 4.How exactly do you fight climate change? I fight climate change on several levels. First of all, in my house: my family recycles, we’re conscious of the energy we use, we hang our clothes out to dry, and eat vegetarian several times a week. At school, I’m the president of the Global Warming Action Coalition. This year, we’re working to maintain a student run vegetable garden and establishing a school-wide composting system. We’ve purchased bike racks and are working on getting hand dryers in our school’s bathrooms to reduce waste. Outside of school, I’m the New England Youth Representative for ACE. As a Youth Rep, I help facilitate at monthly Youth Leadership Trainings, give speeches and raise awareness about youth climate action in Massachusetts, and blog about climate change and my experiences. Last year I was a keynote speaker at a Youth Climate Summit at MIT, and I participated in a Climate Vigil to encourage the Massachusetts Senate candidates to address climate change in their debates. I consider the work I do with ACE extremely important because I’m helping to educate and motivate youth to take action against climate change. I’m spreading a cause I earnestly care about and I find it exceptionally rewarding. 5.What is your opinion about climate change skeptics? I strongly believe all skeptics must wake up to the climate change crisis because it’s a universal issue – it doesn’t matter where you live, or how rich or poor you are, you’re impacted by climate change. And if I could realize that when I was just fifteen years old, children and adults worldwide should be able to acknowledge it too. More importantly, the amount of time we have to address climate change is limited. The sooner the world acknowledges this issue, the sooner we can cooperate to build a brighter future, one where policies are enacted to protect the planet and there’s a change in the human way of life. This means people are conscious of their emissions: they think about where their food comes from and how their houses are being heated, and how all of this affects the environment. People think twice before buying a plastic water bottle or throwing a half-eaten apple in the garbage, where it will be buried under pounds of trash and release methane as it decomposes. 6.Worst case scenario: What do you think your city looks like 10 years from now, if no action had been taken to fight climate change? I envision more frequent, monstrous storms that damage homes, power lines, trees and people’s lives. The destruction caused by these storms will reduce the quality of life in Lexington and be detrimental to the economy as well (especially because Lexington makes a large income on tourism). The intense summer heat will cause many people to perish, and emissions from cars will cause smog in the air, leading to more children suffering from asthma. 7.Best case scenario: What do you think your city looks like 10 years from now, if more and more action had been taken to fight climate change? Ten years from now I hope to see a variety of infrastructure improvements throughout Lexington. I imagine plastic bags and bottles will be rare and backyard vegetable gardens will flourish behind every house. I also envision smaller houses and cars, perhaps even zero cars per household because buses and subways will be the preferred mode of transportation. The bike paths throughout town will be reworked such that they are easily accessible by everyone and the optimal way for children to get to school when the weather permits. The town will save a tremendous amount of money on energy, as solar panels will be mandatory and the rest of the needed energy will be wind energy, produced in one section of town. Education about climate change will begin in elementary schools, where children will also develop the habit of recycling and composting – sustainability will be second nature to them by the time they are in high school. Perhaps my vision of the future is a bit unrealistic or is more accurate as a description of what my city will look like in 20 years, but the core of what I want to see in the future is more education on the causes and impacts of climate change. I feel that if more people understand how human choices and actions are triggering problems like sea level rise and severe weather conditions, they will be more likely to ameliorate their lifestyle in an earth-conscious way. 8.Short and simple: What do you demand from your government as far as climate change is concerned? I demand that the US government 1) reject the Keystone XL pipeline and 2) take climate change seriously by passing laws that are in line with the science and protect our planet and its inhabitants. This isn’t a game. Our future is at stake. 1. What is your name? How old are you? Where do you live? What is your job? My name is Kátia Martins de Almeida. I am 61 years old and I live in Rio de Janeiro, Brazil. I am a clinical Psychologist and I used to live in Boston, MA. Here I was working with streets kids and as a Psychologist in public schools. In 2003 when I came back to Brazil to take care of my mother, I bought land in Cruzeiro. Now I am retired and I live in a two-room-apartment in front of the Sugar Loaf. 2. How does the climate change affect your everyday life in your community? The community life in the village Cruzeiro had totally changed in the last 5 years. More clearly, on the 12th of January 2011 a huge amount of water came from the sky, with lightening I have never seen before. The massive rain broke 50 tons of rocks of from our granite mountains which rolled over the houses of the village. The river raised 3 meters in 3 minutes. In these 3 minutes we lost the only bridge that we had and 20 houses were destroyed. Furthermore, and even more tragic, 2 people died. Cruzeiro is a small agricultural village with 500 families. Most of the people around here are framers. The community is in total grief because of all their losses and sorrows about their identity: the land was completely mud and they had to move to somewhere else. After that thunderstorm the government did not help us. It is rumored that corrupted politicians had stolen money which the Federal Government gave to the City Hall of Teresópolis (another affected village where more than 1000 people died). Fact is the government did not build a new bridge in our village Cruzeiro, neither they helped us to rebuild the destroyed houses. 3. What trigger event led you to start fighting climate change? 2003 when I bought my land, the Neighborhood Association of Cruzeiro found a water source inside it. With 70 volunteers, they built a pipe leading to the village, where the Association has a water wheel and shares the water for a fee of 6 Real (about 2 Euro). Among others, the collected money is for the bakery, the butcher, the shoemaker and for the 20 family-houses, which disappeared under the water on January 12th 2011. 4. How exactly do you fight climate change? I founded a non-profit organization in order to make it easier to help my community. In 2009 I was trying to start a project to transform my 400.00 m2 land of natural jungle (in Cruzeiro, Brazil) into a World Natural Reservation. 5. What do you say to climate change deniers? Denial is a mental disease and must be treated like that. Or they are cynical. I would like to invite them to come to some beaches here in Brazil that are disappearing and also to come to visit the families of the Rio de Janeiro’s agricultural belt. We are the salad garden of Rio de Janeiro! If we loose our plantations, Rio will have trouble eating green leaves and fruits. 6. Worst case scenario: What do you think your city looks like 10 years from now, if no action had been taken to fight climate change? It will disappear because without hope for good future the youth is leaving. There is some kind of “Youth Exodus” in all agricultural villages. 7. Best case scenario: What do you think your city looks like 10 years from now, if more and more action had been taken to fight climate change? If we provide environmental education to the people who live around the river Rio Paquequer, we can avoid a lot of problems about trash and diseases. 8. Short and simple: What do you demand from your government as far as climate change is concerned? Stop killing Amazon, first of all! The government must introduce environmental education in the curriculum of all Brazilian schools. The government has to give us sewers or pipes for ourselves to build our sewers and also they have to give us trash bags to pick up heavy trash. Another point is to talk with the farmers to avoid some bad ecological habits. 9. How can interested people take part in your project? Asking them to come to visit Rio de Janeiro and its rural farms and see the reality that the Media does not show about Rio. Climate Champ – Act now or never! My name is Kaddouche Mourad, born on the 23rd of October 1986 in Algeria. 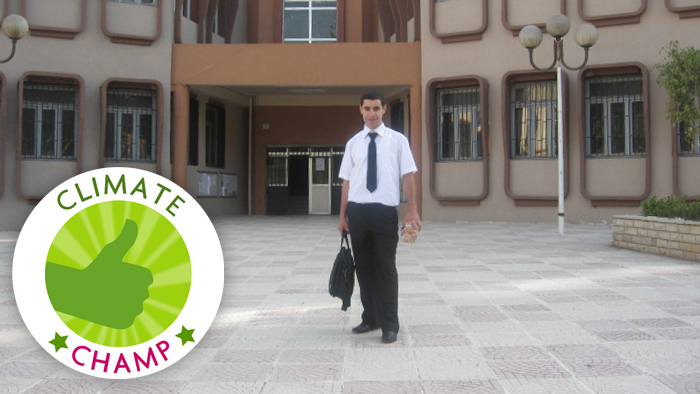 Right now I live in Tizi Ouzou (Kabylia) and I study at the University of Béjaïa. How does climate change affect your everyday life / your community? Droughts are harmful for agriculture and that threatens our food security. A lot of water is needed to irrigate fields, and that takes away from the supply of drinking water! The trigger event was snow that measured four feet (1.2192 meters) high here in Algeria. That happened twice in Algeria, in 2005 and 2012. Both times it lasted more than 15 days. There were many problems for people especially in getting food and health care because neither the local authorities nor the government were able to solve the problems. On the other hand in the summer, temperatures rise to more than 45 degrees Celsius (113 degrees Fahrenheit) – that sometimes leads to forest fires. As a doctoral candidate in biology – to be precise in biology, health and environment – I hope that my thesis will help to solve some questions. My thesis is about olive tree fields as an agro-ecosystem. The topic corresponds to sustainable development because the olive tree ecosystem includes social, economic and ecological values in Kabylia. The olive tree agro-ecosystem helps people to earn more money without using fertilizers, pesticides or herbicides. Some of these ecosystems are still wild and here biodiversity is preserved. I study the different disruptions that occur by monitoring it with GIS (geographic information systems) and by mapping . With the results, I try to get a better understanding of the reality to take practical decisions to help both local inhabitants and decisionmakers improve food safety and the environment. The topic is still in development so of course many points still need to be discussed. What do you say to climate change skeptics? Harmful effects are on the way if we don’t act now! We will see more smog and fewer green spaces. Best case scenario: What do you think your city will look like 10 years from now if further action is taken to fight climate change? There will be fresh air, clear water and still green areas.